In GP history there have been cases of too short and too many, and of too long and too few. It was well into the eighties that the organizers of the Monaco GP deemed it unsafe to have more than 20 cars participate in the race. Their track was short and narrow, the speed of the cars had mushroomed since the advent of wings and more refined forms of aerodynamics, while the big slick tyres had not only reduced their braking distance but made them wider as well, making it almost impossible to pass. Now imagine four to six extra cars - slow ones at that - on the 3km track and you were certain that backmarkers would play a dubious part in the late Sunday afternoon proceedings. Ah yes, that was another one of those quirky Monaco things, the race start being scheduled at 3:30 PM so as not to interfere with the royal family's lunch. But the Max and Bernie Show and its quest for televised order has made an end to all that: not only does the race start at 2 PM these days, as do all the other European events, the 20-cars maximum rule was also ditched back in 1987, with the Monaco GP now falling in line with all the 'normal' F1 events. It will probably be a matter of time before Thursday practice is abolished, just in time for the varying fixture around Ascension Day to become history. On the other end of the scale there have been occasions on which you had long circuits - very, very long ones - and just a handful of competitors. Take the late sixties, for instance, when there were barely enough pukka 3-litre GP cars to go around, let alone when scattered across a 22km circle. So the German GP organizers chose to fill their grids with a smatter of F2 cars doing their own race on the endless Nürburgring - during the Grand Prix! After this debacle Hahne valiantly decided to quit racing, thinking he must have lost his touch, and it was a sad decision when looking at the fair share of good F2 results he had during the late sixties. This also applied to Kurt Ahrens Jr, who showed so much promise in his early single-seater career, comprising two German F Junior titles and several excellent results in F3 and F2, taking a second in the 1968 Eifelrennen and thirds at Hockenheim and Jarama. The breakthrough never came and Kurt decided to switch to endurance racing. Although he took two wins during the two seasons he raced in both David Piper-entered and works Porsche 917s (the 1969 Austrian GP with Jo Siffert and the 1970 Nürburgring 1000kms alongside Vic Elford) these two seasons proved to be his last. The F2 grids on the 1966, 1967 and 1969 German GPs form a remarkable occurrence in Grand Prix racing - World Championship Grand Prix racing that is, since the combination of F1 and F2 cars (or Grand Prix and voiturette cars) on the same track was hardly anything new come the late sixties. Several British GPs of the late fifties had a separate F2 class, allowing in hordes of Coopers as well as oddities such as the Fry. The three late-sixties German GPs however were different in that they had an actual F2 "section", with a separate grid being formed someway behind the F1 grid. That meant that Ickx's remarkable fourth overall time of 1967, in one of Ken Tyrrell's Matra-Cosworth MS7s, was only good for pole spot on the separate F2 grid further back. With F2 having become a serious category in a very short time, the 1966 race saw the debut of several Grand Prix stars of the future. Indeed, looking back the F2 grid shows a very impressive list of names. In the Tyrrell Matras were Ickx, Beltoise and Schlesser, monopolising the first three places, with Hahne in another BRM-engined MS5. Teaming up in Ron Harris' works Lotus team were Pedro Rodriguez and Piers Courage, along with homeboy Gerhard Mitter, in three Lotus 44s. The home front was represented by Ahrens, running his own Brabham BT18 sponsored by oil giant Caltex, the same company that backed his 1968 outing, with good old Hans Herrmann in another BT18 teaming up with later March and Arrows founder Alan Rees for Roy Winkelmann's team. Swiss Silvio Moser was last of the F2 runners but did not start his BT16 because of an engine blow in practice, while Mitter's German GP jinx, that later proved to be fatal, started off three years before, an earlier accident preventing Gerhard from competing. In the end Beltoise won the F2 section, finishing 8th overall, ahead of Hahne, Schlesser and Herrmann. One year later, with F1 grids still barely reaching 20 cars, the German F2 section concept was revived, leading to the invitation of some very interesting machines. The most striking example was the wooden-chassis Protos that also featured an enclosed cockpit. The Ron Harris-entered cars were raced by both Ahrens and engine wizard Brian Hart. Then there was a pair of BMW-engined Lola T100s for Hahne and Hobbs, Hahne's mount being entered by the BMW works itself. A Cosworth-engined example for Brian Redman never raced. They were up against the Matras of Ickx and Schlesser (Jo's example entered by Ecurie Ford France), while Rees and Mitter were out in a pair of BT23s, Mitter's car self-entered and Alan's car entered by Roy Winkelmann. Again Mitter had terrible luck, his engine failing on the first lap. The final F2 car belonged to young Jackie Oliver, who had his Lotus 48 next to Ickx' Matra on the grid. He eventually ran away with the F2 section race after Ickx suffered suspension failure three laps from the end. He finished fifth on the road, ahead of Bonnier's 3-litre Cooper-Maserati, but was ineligible for points. It is this that moves some F1 watchers to exclude these entries from the World Championship statistics. In 1968 there was no F2 section, with Hahne allowed to compete with the big boys on equal terms in effectively the last BMW Grand Prix appearance for quite some time. In fact his Lola-BMW T102 was the only 2-litre car in the field in a classic race won by Jackie Stewart amidst torrential rains. Here are our two local heroes among the true GP greats at the 1968 German GP drivers briefing. The following year saw one final return to the sections concept, as the poor 14-car F1 turn-out was replenished with no less than 12 F2 cars. Just eight of those started, however, as Gerhard Mitter fatally crashed his BMW 269 during practice, leading to the withdrawal of team mates Hahne and Quester, while a sympathetic Hans Herrmann also withdrew. His Lotus team mate Rolf Stommelen decided to race and eventually finished his Lotus 59B in fourth. Again Matra were the class of the F2 field, with the mercurial Johnny Servoz-Gavin setting pole and Henri Pescarolo on the front row as well. Splitting them was François Cevert in Tecno's F2 car, preluding the huge category success of the Pederzani brothers in 1970. Brits Attwood and Westbury - the two connected by the BRM P67 4WD GP car that Attwood tested and Westbury used for several hill-climb wins - occupied the second row, with Dickie in Frank Williams' BT30 F2 and Peter in Felday Engineering's similar car. Perennial F2 racer Xavier Perrot was last on the F2 grid, his year-old BT23C entered by the menacing Squadra Tartaruga. After 14 laps Pescarolo had won convincingly, being the only F2 car on the same lap as overall winner Jacky Ickx. But that was not after Servoz-Gavin's engine had given up and Cevert's steering column collapsed. The later Le Mans veteran was 5th on the road, as has been Jackie Oliver two years before, but Jo Siffert (11th overall in his Walker Lotus) and Jean-Pierre Beltoise (12th in his Tyrrell Matra MS80) were awarded the remaining World Championship points. The common theme to these F2 races at the German GP was not only supplied by local men Kurt Ahrens and Hubert Hahne but also by a class-act German manufacturer, that had chosen to concentrate on the world's second single-seater category instead of F1. Having dabbled with works entries and Lola cars in the late sixties, BMW in fact set out on a path that would take them to utter F2 supremacy in the late seventies, with drivers such as Marc Surer and Bruno Giacomelli proving unbeatable in their BMW-engined cars. It's only when Honda joined the F2 scene at the start of the eighties that the BMW empire began to crumble. Then again, they don't call Honda the Far East's answer to BMW for nothing, a saying which certainly holds true for Honda's in-house engine development skills, which can only find their equal in BMW's. With Ralf Schumacher's stunning recent Imola and Montreal victories still fresh in our minds it's easy to overlook that BMW's share of F1 World Championship history is divided into four separate parts - just as that other great European manufacturer of sporty road cars has an oddly disjointed history when it comes to Grand Prix racing. It's a well-known fact that Alfa's original presence in the championship also has three sequels - first there was the Alfa-powered De Klerk Special, followed by their days as an engine supplier to Brabham and, later, Osella, and finally their second spell as a works effort, albeit run by Paolo Pavanello's Euroracing outfit in their last agonizing years. Ditto with the Bayerische Motoren Werke, which made its first acquaintance with Grand Prix racing through its BMW 328 powerplant in the front of various homegrown Veritas (see above) and AFM (sports) cars, as well as a host of BMW specials. Or even in the curious case of Ernst Klodwig's Heck-BMW when the engine was in the back. All were allowed to race in their home event because of their conformity to the F2 rules that happened to be the World Championship set of rules for 1952 and 1953. These were strictly local appearances, as were those made by the BMW works in the late sixties. Again these were F2 cars but this time they were up against 3-litre F1 cars, usually starting from their own grids, several yards in arrears of the F1 grid. And then there's BMW highly successful foray as an engine supplier during the turbo era, the Bavarians becoming the first manufacturer to allow the drivers championship to be won with a turbo-powered car. And it seems that Paul Rosche's heirs have only just started a fourth BMW period that will be at least as successful as the third one. BMW's second era of single-seater involvement is perhaps the least known of the four - and still it's the longest, spanning a period between 1962 (when the 1.5-litre road-car engine was introduced that would form the basis for the F2 competition engine) and 1981 (when the last of over 500 M12 Formula 2 engines was delivered). BMW's first competitive outings came in 1967 when the unreliable Apfelbeck engine was put in the back of a Lola T100. With Hubert Hahne as its driver, the car sported BMW works livery and finished 12th on the 1967 F2 drivers table. For 1968 BMW commissioned the T102, which Lola purposely built for the Bavarians. It followed the usual Lola bathtub monocoque and suspension, and although the car looked slim from the front it became seriously unwieldy behind the cockpit as Ludwig Apfelbeck's powerplant managed to distort the airflow and overall look of the car. It was therefore no surprise that the Apfelbeck engine was soon ditched in favour of a more compact engine design that would allow the rear end to be fixed up. In its new guise the T102 came good and in early 1969 Hubert Hahne took second in the AvD Trophy but finished as the first non-graded driver, grabbing BMW's first bag of maximum F2 points. In the course of the year the Lola was succeeded by BMW's only self-designed car, the F269, which was later followed up by the F270. Its designer was none other than Len Terry, the man who penned such highs as the Eagle T1G and such lows as the BRM P207. The F269 was a simple and orthodox car and it worked. But its shape was hardly as slippery as the Eagle's and the car's form was usually on a high on fast circuits, thanks to the monumental 250bhp output of the engine. Ickx, Siffert, Hahne, Quester all won races with the F269/270, while the young Austrian became the fifth best non-graded driver of 1970, with Hahne winning the Rheinpokal at Hockenheim. In 1971 BMW switched strategy - having already bought a March 702 for "testing purposes" - and chose to become an F2 engine supplier. They would become hugely successful in this field, their simple but effective four-valve straight-four engines motoring to dozens of wins all the way into the eighties. Even today, the scream of a late-seventies all-tuned-up BMW F2 engine is awesome to behold. The first chronological memory of the Ahrens family (Kurt Sr & Jr) that occurs to this writer's mind is in connection with a scandal that took place at the end of the 1962 FJ season. German journalist and former driver Richard von Frankemberg, in an article in the periodical Das Auto, charged some drivers with having employed 1450cc engines on their cars. That could have been easily done by substituting the Ford Anglia crankshaft by the Ford Consul one obtaining in this way a longer stroke. Von Frankemberg could substantiate his accusations for the cars of the Ahrens, Austrian Bardi-Barry and Swede Troberg. As a consequence, Kurt Ahrens Jr, who had just graduated to German National Champion, was disqualified for six months together with Gerhard Mitter. Von Frankemberg also accused, without proof, the works Lotus of Arundell and Rees of the same trick. Champman made a bet with him of £1000 that Arundell would be able to match the times of the Lotteria GP in Monza in the same car with checked capacity. And he won the bet late in the fall of 1962 at Monza thanks to an amazing Arundell solitary run. After the suspension, Kurt Ahrens Jr went on to a good 1963 FJ season winning the Lotteria GP amidst sarcastic comments, the Eifelrennen and the Tyrol GP on a new Cooper-Ford. With a new Brabham he raced both in F2 and F3 in 1965. A semi-professional driver - his involvement in his father's garage and scrapyard business often prevented him from racing regular full seasons - Ahrens Jr was by that time considered the more promising German driver, the times of the Schumacher brothers being well ahead! In any case, thanks to Caltex backing, he enjoyed a full F2 season in 1968 with a second at the Eifelrennen and thirds at Jarama and Hokenheim, racing sporadically in the other seasons his personal Brabham and Ron Harris' Protos. Ahrens Jr, who had shown good speed already on a Fiat-Abarth, moved to sportscar racing in 1969/70, winning the Austrian GP on David Piper's Porsche 917 in 1969 with Jo Siffert and the Nürburgring 1000 kms with Vic Elford in 1970, after which he retired for good. Ahrens started in the Geman GP from '66 to '69 driving F2 cars, with the exception of this 1968 race where he had his only start on a pukka F1 car, the third Brabham BT24 later used by Piers Courage and Silvio Moser. Entered by Caltex, Ahrens finished 12th in appalling weather conditions. 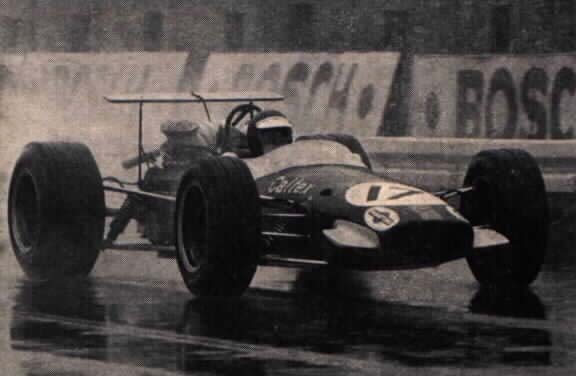 Actually, the 1968 German GP was raced in one of the worst conditions ever, with fog, heavy rain and cold and saw an amazing performance by Jackie Stewart who deeply disliked the track. In his first season with Tyrrell he was driving a Cosworth-engined Matra with which he beat G Hill by 4 minutes in this race, also beating the Ferraris of Amon and Ickx that had been very fast in practice. It is interesting to note that by this race all the cars, with the exception of the BRMs, had aerofoils. In the early years of the 3-litre formula it was a common picture that there were some cars on the grid not making use of the full engine capacity that was allowed. One reason for this could be simply the lack of available engines. The other common reason, especially on the long Nürburgring circuit where cars were passing by the spectators only every nine or ten minutes was that some organizers tried to give some additional entertainment by running a Formula 2 race simultaneously to the Grand Prix. Despite the car of the picture being one of the last appearances of a car with less engine capacity than allowed, it fits into neither of these categories. With their entry the BMW factory simply intended some kind of a test drive to find out wether it would pay off to start a true Grand Prix project. 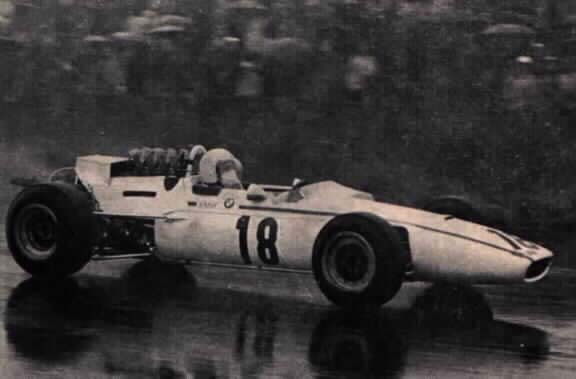 In fact it was the second such effort of the Munich company as Hahne had already made his Grand Prix debut (not counting his Formula 2 appearance in 1966) in a similar car the year before. To make things easier BMW had again ordered a chassis from Lola, like Honda had also done with their Grand Prix car, too. And, also like the Japanese company, BMW had entered the car under their own name. So in fact the 1968 German Grand Prix saw the strange appearance of two works cars of the same manufacturer entered by the works teams of two different automobile makes! Regarding his engine disadvantages Hahne did comparatively well by finishing 10th even beating his fellow countyman Ahrens in the pukka Formula 1 Brabham. Hahne had begun racing in the mid-sixties with BMW touring cars and he remained connected to that company nearly during his whole career. In the Formula 2 class of the 1966 German Grand Prix he finished 2nd in a Matra and so he became one of BMW's works Formula 2 drivers from 1967 to 1970. In this last season he took delivery of a brand new March 701 for his home Grand Prix at Hockenheim. As this was his favourite circuit he expected to do well and therefore he was bitterly disappointed when he failed to qualify. Blaming the March factory for this failure he threatened legal action, contending that the car was delivered in an unraceworthy condition, proved by the fact that he - a BMW works driver - could not get it on the grid. When the March transporter crossed the German border after the Austrian Grand Prix it was impounded by the police. Finally the case was to be settled in a subsequent showdown session at Silverstone. The agreement was that if Peterson could not achieve an agreed lap time, Hahne would have won the case. He felt safe as at that time Peterson was a complete novice who could not possibly be expected to go as fast as he did. But Peterson swept the agreed time and Hahne returned home and immediately announced his retirement from racing.